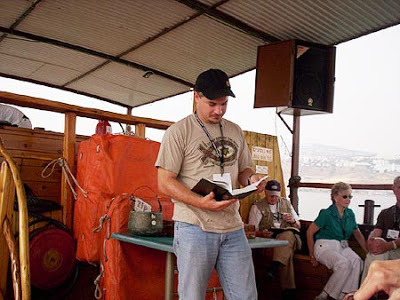 We continue on our Lamb & Lion Ministries’ 2009 Israel Tour by exploring on and around the Sea of Galilee. 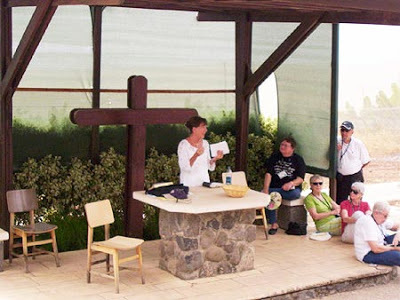 Other than Jerusalem, Jesus spent most of his ministry time around what’s now called Lake Kinneret. It was a very hot and hazy day, but not too obscured to see as we made our way around the full circle. Tiberius, the Roman city built by Herod Antipas (Lk. 3:1), is a strange mix of ancient ruins intermixed with rising hotels, theme parks and tourist shops. Across the street from this abandoned mosque is a carnival and trampoline jump. 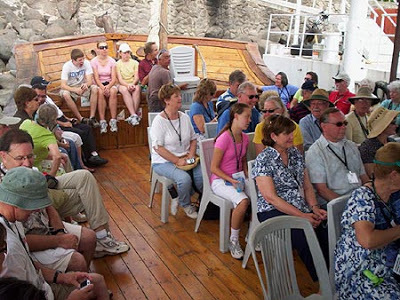 The group begins its day loading up onto a guide boat and sailing out into the Sea of Galilee. 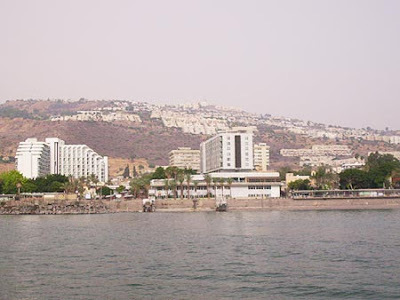 Tiberius and our hotel as seen from the Sea of Galilee. 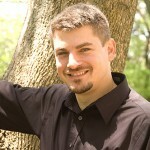 Nathan Jones gives the devotional where Jesus once walked on water. Don’t be like the other disciples, but be like Peter. Have some faith and trust in God and get out of the boat of life and into action for Him! 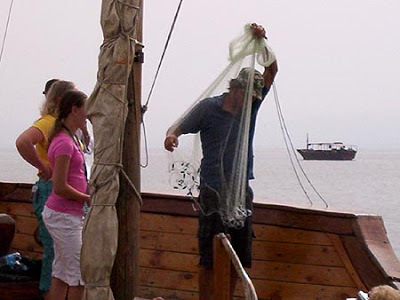 One of the boat crew demonstrates how to throw a net the way the fishermen of old did. He caught nothing (should have cast it on the other side). We dock at the Jesus Boat museum. Or, is it the giant gift shop with a wing for the Jesus Boat? Hmm. 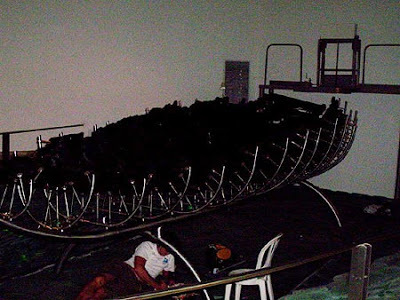 Amazingly, this boat was preserved in mud for 2,000 years, giving archeologists like the one under the boat a keen insight into ships of the First Century. 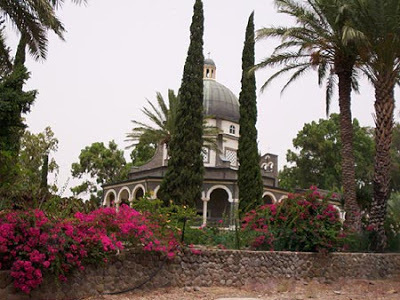 This wonderfully landscaped church sits on the traditional site (aka the Catholic Church decided) where Jesus gave the Beatitudes (Matt. 5; Lk. 6). A large pope poster, monks and nuns greet folks in a “shrine” dedicated to the worshipping of the sacraments. 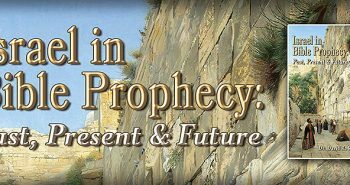 Mary Ann Roberts gives a devotional on the Beatitudes. “Woe to you, Korazin!… If the miracles that were performed in you had been performed in Tyre and Sidon, they would have repented long ago in sackcloth and ashes” (Matt. 11:21). At the ruins we hold a healing service. 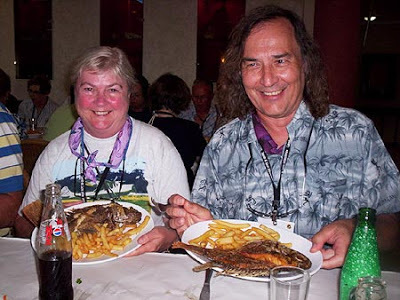 Kent and Marilyn Hoeft demonstrate lunch, feasting on St. Peter’s Fish. 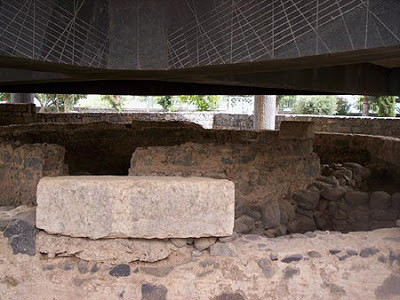 At Capernaum, the headquarters of Jesus’ ministry, is the ruins of Peter’s house, now built over by a UFO-like Catholic church. Archeologists are almost positive this house is truly Peter’s. (Matt. 8:14; 17:25). 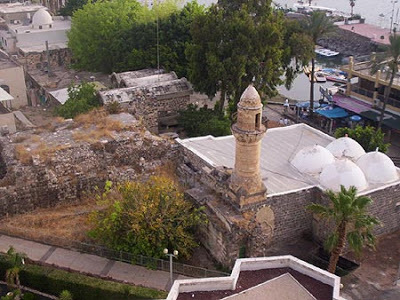 The Byzantine-era synagogue built on the ruins of the one contemporary to Peter. The group enters the Jordan River for a baptismal service. 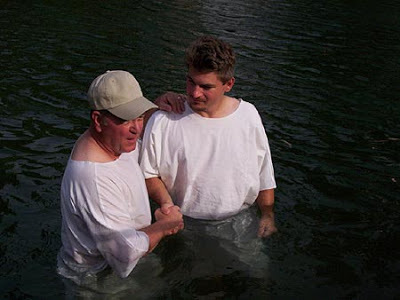 Don McGee is baptizing Nathan Jones. After the group all had their turns, a young woman from Ethiopia came up to Dr. Reagan and asked him to baptize her! 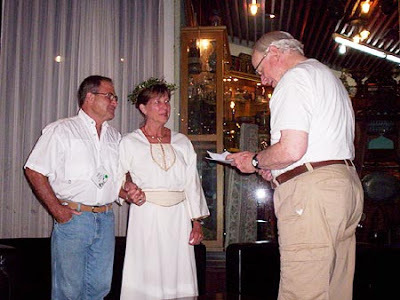 John and Mary Ann Roberts recommit their vows on their 40th anniversary, officiated by Dr. Reagan. 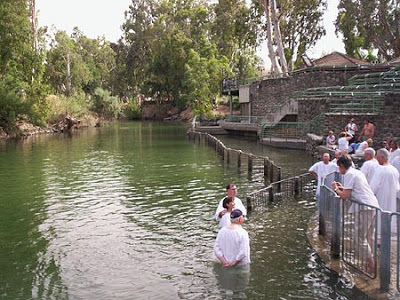 Getting baptized in the Jordan River means getting your feet nibbled on by little fish. Banana plantations now fill all fields around the Sea of Galilee. It’s hard to picture Jesus teaching while his disciples and crowds munched on bananas. 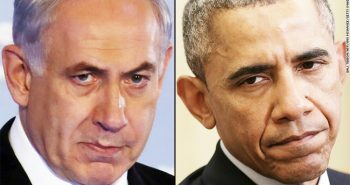 The Palestinians want the Golan Heights, which is the East side of the Sea of Galilee. It’s a rocky patch of worthless-looking hills. Eating St. Peter’s Fish means having your meal stare back at you. Tomorrow for Day 6 we leave the beautiful city of Tiberius and head south to Nazareth and Jerusalem. Thank you for your continued prayers for our traveling mercies and health! I'm really enjoying your updates Nathan. Just out of curiosity, does anyone know how much a trip like that would cost? — Well, as long as they are not Piranha, I guess that is okay. Hey, Nathan, how come you got baptized again? Is there something I don't know—like it didn't 'take' the first time? Thanks for the updates. My parents are with you and I am happy to hear what they are doing and see them in some of your pics! We made the pilgrimmage with Dr. Reagan last year (2008). The cost at that time was about $3500 per person with double occupancy. 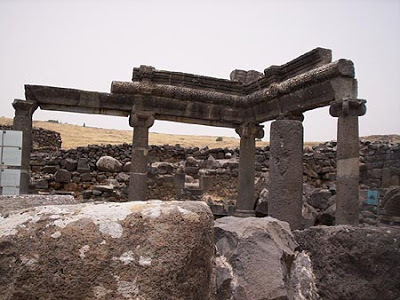 That includes airfare, transfers, hotel, three meals a day,and tips as well as all entrance fees for side trips (Masada, Garden Tomb, Beit She'an, etc). Pretty much all inclusive. The only thing you have to buy are souvenirs and water to drink during the day. We departed from Dallas, so the cost may increase depending on your connecting flights. If you are thinking about this trip, DO IT!!! Dr. Reagan has so much insight and knowledge. 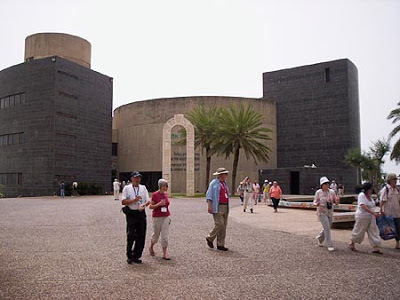 Others on our trip had been to Israel before with other tour operators and said there was no comparison. $3500 is about right on. Hopefully we'll have the dates for next year's tours and will post them as soon as they're set. Awesome picts! I don't know why, but about 1/3 of them are showing up as little red X's for me. But I figure we'll see them next time we're down there. My favorite two picts are the aquaduct, which while still impressive now must have been downright awe-inspiring 2k years ago. Seeing it stretch off into the horizon really catches my breath. 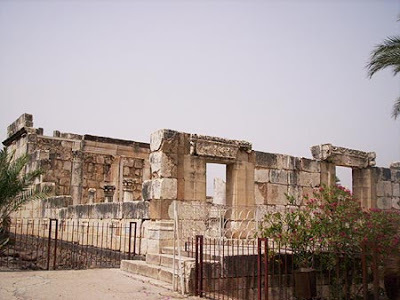 I can only imagine what the Temple used to look like when the disciples admired it during one of their Passover visits. And to think that it is nothing compared to the glories we'll see in Heaven! My other favorite pict is Dr. Reagan standing next to the Pilate Stone. Another hecklers' arrow, broken! 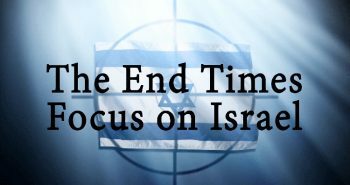 Not that it matters; there will be doubters right up to and including after the Rapture. Be safe, brother. May God watch over you. Thanks for the info on the approximate cost. I'd love to go one day. Maybe one day I'll get to. I'd especially like to go with Dr. Reagan. But with late bills and short work…. That, and I'd probably never get my wife to go: they're killing each other over there, you know. Interestingly (and ironically), little kids play in the streets and Jews and Arabs live and work side-by-side. Our guide says per capita Jerusalem is far a safer a place to live than most U.S. cities. 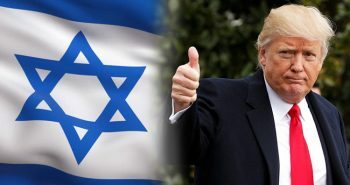 I would like to tell that I too have recently visited Israel with the help of Gama tours which was a great experience with them.